After eating at Haven Gastropub so many times, I finally made my way to taco asylum which is manned by the same people and chef. It's located in The Camp in Costa Mesa next to the Native Foods Cafe (in case you can't find it). Duc and I were curious as to what their tacos tasted like, especially after reading their online menu. So we walked into the open area (the front "wall" is pretty much two big doors) and saw the same menu we had seen online written on a chalkboard. 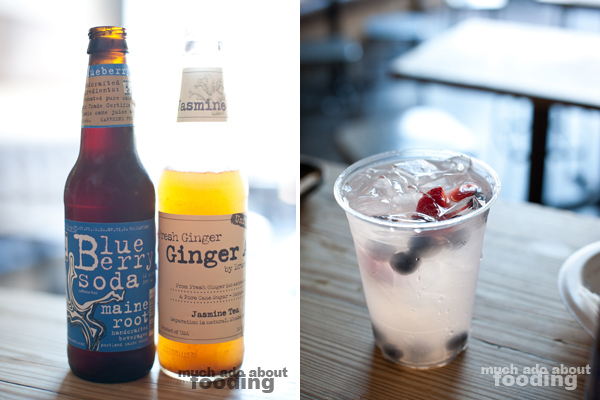 The neat thing that we didn't know about were the variety of drinks available that weren't just beer - thus, we opted for some craft sodas: a blueberry one and a ginger ale jasmine tea. Wow. Those were to die for. We even looked them up on our phones to find out where to get more. We also experimented with the different hot sauces they had on our table. In the picture, from left to right, were the Scorpion, Mediterranean Ghost Chili, Ghost Chili, Smoked Red Savina, and Honey Habanero sauces which went from hottest to least hot in that order. Now, we're both sissies when it comes to spicy stuff so we only tasted droplets of each but man was there heat! It was nuts. Our third drink was the berry limeade which we needed after trying out the sauces. So what was our order? Taco asylum is cool because they offer a flight sampling of their first 8 tacos on the menu. Their tacos are normally on 6 inch tortillas so their flight samplings offered them on 3 inch tortillas which was fine since we had somewhere to go after. The first 8 were the grilled octopus, pork belly, short rib, curried paneer, wild mushroom, lamb, duck, and steak. Sound delicious already? Well feast your eyes on the pictures. We went in the order on the menu as we each took a bite per taco (it was pretty much a two-bite piece). For all of them, the slightly crisp tortilla was consistent and paired well with all of the ingredients that made the tacos not quite normal (there wasn't a Mexican style one...). The grilled octopus had Kalamata olives, oregano, Feta cheese, and tomatoes on top of the perfectly grilled baby octopus. Next was the pork belly which was surprisingly like a pork banh mi sandwich in all parts including the pickled carrots, daikon, onions, and cilantro. I would've passed on a normal sized one considering the price and its likeness to banh mi (or was that the point?). Next was the short rib which had pickled red onions, salsa verde, Cotija cheese, and cilantro. Is it bad to say that I don't quite remember how it tasted? I think it was just eclipsed by how awesome the curried paneer taco was with its raita, tomato chutney, and scallions. I mean, wow, what a way to capture Indian food in a few bites. It doesn't help that I also really love paneer. The texture of the paneer with the spice-ridden sauce was music in my mouth, and the extra touch of making it a naan tortilla was genius. Our next favorite from the flight was the wild mushroom with the chickpea puree, parsley salad, and fried chickpeas (who knew?). What an interesting concept that worked well in taco form. The mushrooms were very savory and the fried chickpeas added a fun crunch alongside the tortilla. Lamb came next with its olive tapenade, ratatouille, and mâché, and surprisingly it did not impress. I think the olive tapenade was just too heavy so that it overpowered the other tastes in the taco. Then we had duck with Camembert, dijon crème fraîche, and purple fingerling potatoes. I really liked the crisp from the potatoes and the cheese actually complemented the duck well; the only issue was that the duck was a bit overdone. Our last was a good one to have at the end since the steak with its chimichurri, buttermilk fried onions, and potato hash was bursting with flavor and juiciness. Did we stop then? Well no because there was a ghost chili pork taco on the menu. How could we resist a challenge? We snagged a taco plate which came with two normal-sized tacos and their version of rice and beans (Israeli couscous and lentil salad). I'm so glad that we got the sides because I'm not sure how else we would have survived the attack of ghost chili on our mouth. Our two tacos were the ghost chili pork and the curried paneer since that was our favorite in the flight. To save our tastebuds for the good stuff, we had the paneer first before tackling the ghost chili pepper replete with chili threads and pork cracklins. It looked so scary with all that chili on it and man did it burn. I ate my half slowly and felt the heat throughout but silly Duc decided he'd eat it all in one fell swoop. He said it wasn't bad but I told him to wait just a little bit for it to hit him all at once...which it did. Oh the tears! Bad idea but good meal. My only concern for an everyday eater is the price since a regular taco goes for $5 which is a tad high for a taco (though of course, the ingredients are great). By the way, they have a screen with all their Twitter tags showing up so check out on the picture how many times I was on that screen that day!